Mrs. Madhumita Bhattacharya is a Psychologist and Movement Therapist and has 6+ years of experience in this field. She has completed M.Sc. in Psychology from University of Calcutta, Kolkata in 2011 and her Diploma in Dance Movement Therapy from Pradeep – A Centre for Autism Management & Rhythmozaic Dance Movement Therapy Centre, Kolkata in 2012. She is well experienced in handling patients suffering from various mental health issues. 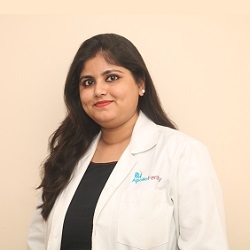 Mrs. Madhumita started her career from Nova IVI Fertility, Kolkata and has counseled thousands of patients suffering from infertility and undergoing treatments for IUI, IVF, ICSI, PESA, TESA along with patients going for Donor and Surrogacy cycles. Being a Movement Therapist, she has immense knowledge about the human anatomy and the different neuromusculoskeletal issues a person suffers from and ways to treat them. As a Psychologist and Dance Therapist in Recoup-A Neuromusculoskeletal Rehabilitation Centre, she has worked with children and young adults suffering from Cerebral Palsy. She has hands-on experience in dealing patients who has suffered from Cerebral Stroke, post-surgical rehabilitation for patients who had musculoskeletal surgeries, and people suffering from work-related musculoskeletal injuries and treated them with Movement Therapy modalities. She has also worked with colleges and schools as a part of the responsibilities during her working tenure in Medall Healthcare Pvt. Ltd. She has also treated children with Autism, Cerebral Palsy, ADHD etc. Mrs. Madhumita has a keen interest in identifying children with learning difficulties at a young age and provide SOI therapy to treat it. At present, she is working with Apollo Cradle & Fertility, Brookefield, Bangalore. • Workshops on creating awareness regarding Mental Health, Emotional Well-being, Parenting, Stress Management, Suicide Prevention in schools, colleges and corporates.